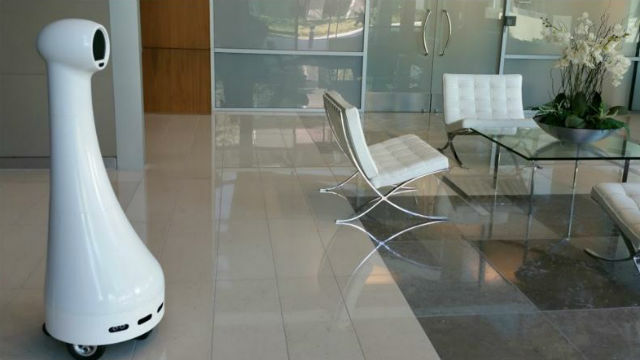 NXT Robotics’ IRIS monitoring a building lobby. At a recent symposium on robotics at Qualcomm’s auditorium in Sorrento Valley, a friendly white robot with a hoodie-like head greeted attendees. 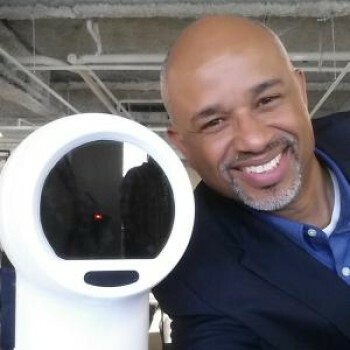 IRIS by the year-old startup NXT Robotics is a product designed to revolutionize the dull, dirty and sometimes dangerous work of commercial security. Times of San Diego spoke with founder and CEO Jeff Debrosse as the company nears the first shipments of its robot. Why did you start NXT Robotics? I started NXT Robotics because I envisioned the need for security automation increasing at a very fast rate. Beyond the traditional automation requirements in factories, there are tasks that organizations across the globe need to perform on a regular basis. Physical security monitoring and reporting is one of those tasks and it is a highly repetitive process that is ripe for automation and cost-cutting because the economics don’t scale well when an organization has to increase its security monitoring and reporting efforts. Our company is comprised of a team of people focused in on that specific problem. I’ve been developing hardware and software products most of my life, but I was always intrigued and challenged by the idea of building cost-effective robots and a sustainable business around service automation. The mature cell phone industry ushered in a new era for robotics and other technologies. As parts to build cell phones were being purchased in the millions and even billions, the size and prices for components such as cameras, GPS units, processors and assorted sensors dropped by an order of magnitude. Today we’re able to build very cost effective robots and pass those cost savings on to our customers. How does an autonomous robot fit into a company or institution’s security operation? There is a mantra in the robotics industry: “Dull, Dirty and Dangerous.” Those are the “Three D’s” that you should typically try to address when considering adding robots to a company’s operation. With regard to security operations, our IRIS platform was designed to augment an existing security team. For instance, if there’s a disturbance in a part of a building that should be unoccupied, the robot can be sent to the disturbance prior to the security guard showing up. Conversely, if the robot is in the area of the disturbance, it will dispatch itself to the location after alerting the on-site staff. All information (including audio and video) are sent back to the security desk. There are numerous other sensors that pick up environmental data such as temperature changes, open flames and gas leaks as well as gunshots, breaking glass and slamming doors. This ensures that the security staff quickly gain situational awareness and can make faster and more informed decisions before possibly putting themselves in harm’s way. Secondarily, depending on the location, security guards are often double-tasked as concierges, providing venue information and assisting people with finding various locations. Our IRIS robots have a constantly updated database with the suite numbers of offices in buildings and elevator/stair/exit/restroom locations so they can provide directions or guide guests to those locations. How do humans react to your IRIS robot when they first meet it? That’s an interesting question because we were pleasantly surprised to find that people almost immediately want to speak to IRIS or take selfies with it! We were very purposeful in designing IRIS’ body, face, voice, height and speed of movement. IRIS’ appearance was specifically created to support our vision of robots and people being in close proximity to each other. Our goal wasn’t to make a human-looking robot, but one that is functional and fits well in human environments. From the responses that we’ve received since unveiling IRIS, It appears that our R&D, in all aspects of building this robot, has paid off. But we’re always taking in feedback no matter how formal or informal. That has helped us get to where we are and we believe it will continue to be one of our key success factors. When will the first production models be available? The first production models will be available in January . During the last quarter of 2015 we have been actively meeting with prospects, conducting demos, showing the return on investment, hosting Q&A sessions and taking orders. So far it looks as if 2016 is going to be a much busier year — and I’m absolutely looking forward to all of the work we have ahead of us. We’re also in the process of signing up our first international partner in Australia to cover the Asia-Pacific region. That’s an important move because the security services market in the U.S. and Asia-Pacific are the same size — an estimated $20 billion. More details will be available on our website once we complete the partnership. What markets do you expect to be the first to employ security robots? Although I think security robots are applicable across almost all market segments, the markets that have been very responsive to IRIS are commercial realty-management, data centers and parking-management companies. Companies in each of those verticals have approached us with specific security monitoring requirements that we were able to address. Some of those shared requirements are roaming and patrolling large open areas, interaction with people and moving objects, as well as interaction with people — all with a high level of autonomy.